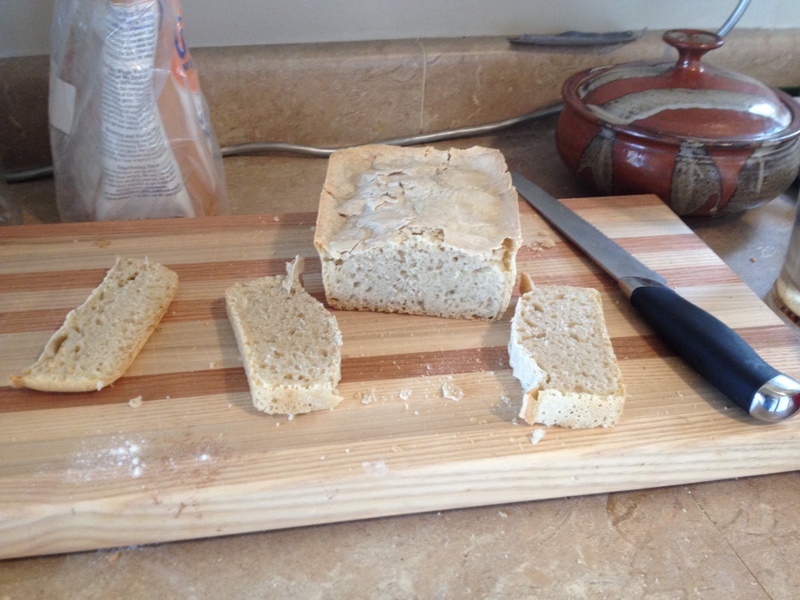 Regular readers of this blog know that I’ve been trying my hand at making my own bread from scratch. It’s been a couple of months since I started and now have more than a dozen loaves under my belt — literally and figuratively! In my last bread blog, I told how I had tried a new sourdough recipe and it worked OK; maybe not as well as I wanted, but it worked. Since then, I’ve baked a few more loaves; but the last two that I did came out like bricks, really thick and heavy! Even though I fed my sourdough starter every day (and even hired someone to feed my cat and sourdough daily when I was away! ), it still lost its umph. So, I started a new culture a week ago. Here it is with some fresh flour looking good and bubbly…. and here’s one of the first loaves…. It’s maybe not so pretty as some of those that people more experienced than I might make, but I can attest that it’s very light. Pick it up, and it almost seems to float off your hand! It’s like a big marshmallow. I used the same recipe as before, except I used Organic All Purpose Flour rather than whole wheat. For cosmetic purposes, I probably ought to invest in a bigger pan, rather than splitting the dough into two standard loaf pans. As it is, one pan is too small without the dough rising over the sides and overflowing; two pans results in a thinner loaf. Pretty or not, I now prefer to eat my own bread than “store bought.” And I certainly have a greater appreciation for others’ home baking! I’ll keep playing with it, and keep you posted. Jim PathFinder Ewing is a journalist, author, and former organic farmer now teaching natural, sustainable and organic agricultural practices. His latest book titled Conscious Food: Sustainable Growing, Spiritual Eating (Findhorn Press) is in bookstores now. Find Jim on Facebook, follow him @EdiblePrayers or @OrganicWriter or visit blueskywaters.com. Modern homesteaders, that is, urban and rural folks who are into self-sufficiency, could do little better in regard to their food choices than delving into probiotics. Simply put, probiotics are the tiny organisms that help maintain the natural balance (microflora) in the intestines. That may sound yucky, but it can be tastier than it might sound. If you visit Rainbow Natural Grocery Co-Op in Fondren, for example, you’ll see row after row of “natural” sauerkrauts in a remarkable variety of flavors. That’s probiotics. If you dine at a fine Asian restaurant and sample the spicy and wonderfully complex flavors of kimchi, that’s probiotics. Finally, if you grew annoyed at the Jamie Lee Curtis TV ads touting how her body is in such great intestinal balance, that’s (yes, you guessed it) probiotics. Probiotics is a form of homesteading because it’s all about taking leftover or common materials and recycling them into healthful, edible food. The “sauerkrauts” at Rainbow are carefully fermented unsold produce; Kimchi, basically, is fermented cabbage that was too tough or bitter to eat straight from the fields; Curtis’ product is yogurt with a trademarked probiotic culture added. 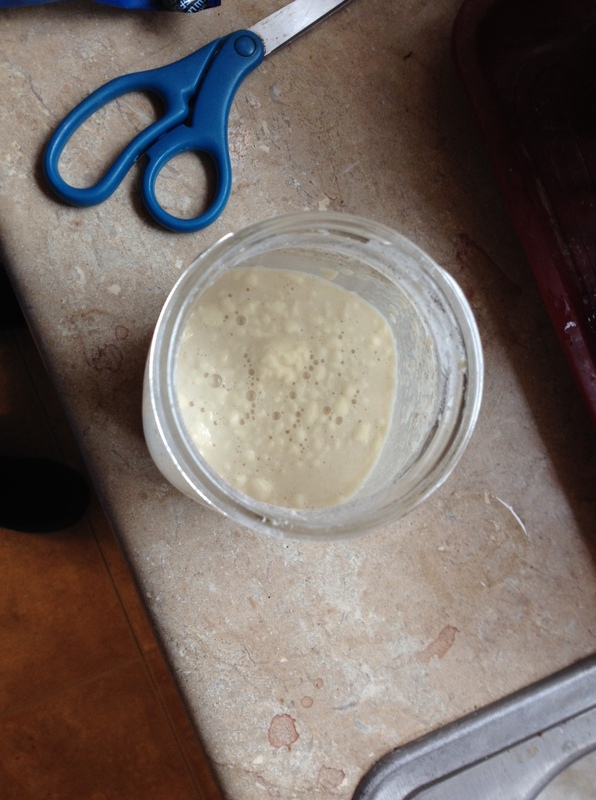 It all boils to lacto-fermentation: a long word for homegrown food. As my beautiful wife Annette has blogged (blueskywaters.com/articles.html): Dr. Andrew Weil makes his own sauerkraut, not because it’s a way to preserve summer crops and eat them all year, or a cheap way to recycle old, tough, bug-eaten or leftover garden crops (which it is) but because it’s a healthier way to eat. “Fermenting does some of the digestive work for you, so it makes a lot of foods more digestible and the nutrients in them more bioavailable,” Weil says. Unlike other methods of preserving foods, lacto-fermentation actually increases nutritional value. Read about more fermentation methods and recipes in the book “Wild Fermentation: The Flavor, Nutrition, and Craft of Live-Culture Foods” by Sandor Ellix Katz (Chelsea Green, 2003, $25). Everything you need to make homemade yogurt is probably already in your kitchen, with the possible exception of a thermometer. Visit makeyourownyogurt.com/make-yogurt/what-you-need. Here’s a term that has gained popularity in the past couple of years: urban homesteading. It means making your property, or “homestead,” as self-sufficient as possible, regarding food and supplies, while living in an urban setting. You could also just call it sustainable living. Either way, I’ll write on this topic from time to time. Our first stop: keeping bees. Bees require specialized equipment and are impossible to corral. You’ve heard of trying to herd cats? Bees are worse. They range a mile in every direction and get into anything that promises the sweetness of flower nectar — including, in one instance, invading a Brooklyn, N.Y., maraschino cherry factory and producing metallic-tasting red honey (! ), The New York Times reports. Because bees go so far afield, if a jar of honey is labeled “organic,” be wary. Unless the bees are out in the middle of nowhere, it’s impossible to certify their food sources. If you have an acre of land or less in an urban setting, I don’t advise trying to keep standard-frame hives. Neighbors might complain—and rightly so—about 200,000 or so honeybees living next door. To get around this, a number of urban beekeepers have joined together to provide rooftop hives. “Secret” rooftop-hive locations include The Whitney Museum in New York City, the Lloyd’s Building in London and the Opera Garnier in Paris, The New York Times reports. For city dwellers, particularly those living in apartments, rooftop hives may be worth looking into, but for most urban homesteaders interested in keeping bees, a few enterprising folk are making alternatives to standard, commercial hives. One option is called an English Garden Hive, which is lightweight in comparison to standard frame hives and decorative. Some call this “the hive of the future” for backyard gardeners. Another choice is called the Kenyan, or top-bar hive, which is so adaptable that you can use boxes, 55-gallon drums, old crates or even a cast-off refrigerator for your hive. Either way, the idea is to harvest just enough honey for your own use, and let the bees keep the rest. Most beekeepers keep stacked hives, adding hive boxes to the top, called “supers,” for the bees to produce surplus honey for commercial purposes. But garden hives are small to begin with and usually don’t have a number of supers. They’re meant to house bees to pollinate your crops, thus improving produce yields, while also supplying a small amount of honey for personal use. Urban beekeepers should also buy a bee variety that usually maintains a small population, is gentle to work with, and doesn’t swarm a lot, such as Italian bees. • Kenyan Top-Bar Hive—See videos at bees-on-the-net.com. This site also has a ton of other information and links about bees and beekeeping. • It’s getting a little late in the year for buying bees, but Keith Dale of Wee Three Bees Apiary in Hattiesburg, who keeps natural Italian bees, says he plans to have some bees on hand for sale into June. Visit his website, beelicioushoney.com, or call 601-447-6994. • “Natural Beekeeping: Organic Approaches to Modern Apiculture” by Ross Conrad (Chelsea Green, 2007, $36) is a good book on chemical-free beekeeping.